The Russian Church is doubtful regarding the glorification of Evgeny Rodionov, the soldier who in 1996 was beheaded by Chechen rebels for refusing to remove his cross and embrace Islam. "There is no documented information so far about the circumstances behind the death of Evgeny. All the stories and all references we have, though some are analytical, are only perceptions and stories of some people on this issue," said the secretary of the Synodal Commission on Canonization, Archpriest Maxim Maximov. To be canonized, Fr. Maxim Maximov explained, "there must exist responsible and valid witnesses of the death of Evgeny, but they all died." Fr. Maxim further stressed, "There is only one witness alive to talk about the death of the soldier, and that witness is his mother who was not even present at the death of Evgeny, so she can only be called a witness in a conventional sense, and not conditional." "As you ask me today, in the same way I asked the mother of the soldier as follows: How do you know that your son died in this way?" said Father Maxim. "The mother then told me that this is the stylistic method of any Russian soldier arrested and killed." "The Church can not be based on stylistic evidence, but essential," added the secretary of the conciliar committee. According to Fr. Maxim, in this way the Church may be asked to declare thousands of soldiers killed in Chechnya. "And why not, if this is a stylistic question, then try to convince me that all the soldiers are Christians and know why they died?" said Father Maximos. 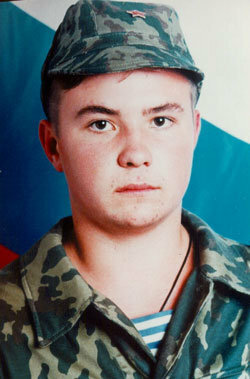 Evgeny Rodionov was a soldier of the First Chechen War under Yeltsin. It is worth noting that on the 100th day anniversary of the capture of Evgeny Rodionov, a picture of his began to stream myrrh in his birthplace in Penza. In Russia books have already been published about his life and martyrdom with the blessing of the late Patriarch of Russia Alexy II.